I bought my first pair of these shoes 10yrs ago. They have a ridiculous number of games on them and thought it might be time for a new pair. Hope I can get 10yrs on these bad boys. You get what you pay for. Price may seem high, but the shoes are a complete kit. I have used other shoes, but do not compare to the 3G. poor quality. had my 1st pair for 8 years bowling twice a week. got a new paur 2 years ago and dropped to once a week and the stiching on the slide foot around the sole wore out. eventually the material came loose and couldn't wear them any more would trip when i tried to silde. called 3G to compalin and of course they didn't care. This is my second shoe for bowling and I'm very very glad I purchased these. I have heard that the shoes are more important than the ball and I would have to agree this is fact. Without comfort and control who knows what can happen. I use these shoes every time I bowl for practice, fun, or when the heat is on. The kangaroo leather is very pliable and sturdy. I have flat feet and these do not affect my play. They are a smidgen bigger but lace up tight. The only problem I have with these shoes is the tongue guide: the laces under it are hard to grip, if at all possible. But this shoe gets a 5-star rating because the features outweigh the minor trouble of the lace under the tongue guide. This shoe I would gladly purchase again, and again... and again. I have heard nothing but great things about these shoes at my bowling alley, and for good reason. It comes with a shoe booty on the sliding foot for trips to the car or "dirty places". I use the deerskin sole on the slide foot. My foot had been sticking a bit after weeks of use so I put a couple of taps using a Master Puff-Ball to add slickness and BAM! new sole action. He was impress with the shoes! Love it! He like the way the shoe fit. He also stated that it is a light shoe and feels good on his feet! I haven't purchased a new pair of bowling shoes for over 10 years. Before I had these shoes, I had a total of 6 honor scores. In the three weeks since I've had them, I have had 4 honor scores already. They are an absolute must for anyone who wants to elevate their game to the next level! When I first bought these shoes I was happy with the fit and comfort. But over a relatively short time, the right shoe developed a bulge in the front center of the shoe. I religiously kept the shoe expanders or whatever their called, in the shoe when not in use. The shoes are very high quality, and look amazing. I ordered my normal size and the fit was spot on. My only issues so far is the #3 slide is supposed to be the 2nd most amount of slide, but I find it to be the least amount so now I need to purchase the #2 slide which I feel should of been included. One thing I like about the shoes, unlike the Dexter shoes I considered, is these come with 3 heals, and 3 slide pads. The Dexters come with one of each from what I understand. By far this is a better deal... I was able to bowl with them immediately, they broke in easily and fast. Extremely comfortable and the variety of sole options makes it possible to get the exact slide action for anyone. I've gone through 2 push-off toes but purchased 2 extra Perfect Approach push-off toes and replaced them on the right shoe. The toes are replaced using the velcro already connected to the shoe however the velcro is not strong enough to hold the new toe during bowling. I used either Gorilla glue or super glue with the new toe and it holds. This is the most comfortable and most durable shoe I've ever used (out of leather Dexter's, Brunswick, etc.). It's a little wide but does lace up nice and tight. If you typically use a higher size because of wider width, you may be able to drop down by 1/2 size because it is a very wide shoe. I use the 3G's for all my bowling events, league and tournament bowling. The have improved my stability on the approach and improved my balance on release. I own a pair of Dynothane Tour Ultra from 12 years ago that got to small but I loved them so I bought a pair of Dexter SST8 red/black version to try a different shoe but first pair broke at sole replacement pair still had issues with my slide be very inconsistant so my wife tired of hearing me about the Dexters bought me the 3G Tour Ultra after I told her Id need 1 size bigger and now Im back to my old ways of sliding and thats perfect no issues at all. Dexters to me are a waste of money Tour Ultras are the best shoe for me there much more comfortable as well I love these shoes. If your reading my review and are thinking about buying Dexter SST8 or 3G Tour Ultras do your self a favor buy the Tour Ultras unless your going to be bowling in PBA tournements then buy the Dexters. I have wide feet and these Tour Ultras are plenty wide for me. Great shoes, no complaints at all. Long time bowler, first time league bowler I decided to splurge on these shoes and I'm very happy with them. I haven't experimented too much with different sliders, but the mid range ones work well for me. They come with a protective slipper for the slide shoe so don't buy one like I did. I bought these to use in league play and tournaments. Great item. Best shoes I have ever had. By Stretch from San Jose, Ca. These shoes are a good product. These shoes have great versatility. I was impressed as soon as I opened the box. Some form of usage instruction for the interchangable parts would have been nice. Unfortunately after my fourth night using the shoes, I noticed that the rubber on the non slide foot starting to peel away from the bottom of the shoe. Not on the toe where you would expect it but rather the inside of the foot. Hopefully this is taken care of with the warranty and the next pair of shoes are better. Missing heels for left shoe. No heels received. 2 sets of soles, no heels. I wish I could get a refund!!! Looks great. Feels great. Problems start out of a need to replace the right toe (RH bowler). I drag my right foot. It took weeks to get a replacement toe . When I did get it, it was not fun replacing it. Following the instructions to the letter, there is a gap on both sizes of the toe where it meets the original rubber. I purchased a second toe, just in case I got a bad one. Same thing, too slight exposure on the edges. It DOES NOT look like it did when I bought it. Then, I decided while I'm chasing the toe, I might as well replace the sole. 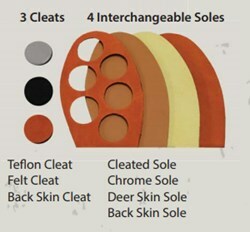 I use the sole with the teflon circular inserts. It took weeks to get those too. When I got it, I had to cut it as it comes square with cut-outs. When I tried to line it up with the holes on the original, they do not. So, you have to set the replacement on the bottom, trace the top one then cut out. That doesn't work out well UNLESS you cut on the inside line (if a thin sharpie is used - bleeds). So, I have to trim thin slices off with scissors. That doesn't work out so well either. i used the glue they recommended. About 4 weeks later, the toe is coming off. I WOULD NOT RECOMMEND BUYING THESE BECAUSE ONCE YOU NEED TO REPLACE THINGS IT IS NEVER THE SAME. Thed two type of Tour Ultra shoes one is Kangaroo leather and the other is Cowhide is that the only difference? All of the 3G Tour Ultra shoes have Kangaroo leather. The Sport Ultra is the 3G shoe that has Cowhide leather. Also the Tour Ultra comes with more accessories included than the Sport Ultra. So if you have a slight toe drag on the push off show are these gonna peel back like on the Dexters sst8s? Hello! This shoe has a fixed sole on the push foot so it should work well for bowlers with toe drag. Hello Mike! The lower the number, the more slide the sole will have. So yes, the #3 sole will be more slippery than the #6. Hi! The Tour Ultras will be a standard D width. Do these shoes run true to size or should I go down a size? Does the shoe run true to size? Do they come in wide at all? Unfortunately, for this shoe, this will not come in a wide width. It will come in a standard D width for men. I am a woman and want a classic black leather shoe like the 3G Ultra Sport; I wear 7-1/2 medium. 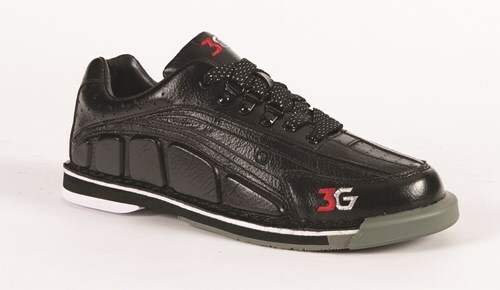 Do you know if the 3G is available in men's size 5 or if they make women's in black? The smallest size that we have to offer in these shoes would be a size 6.
do the 3G Tour Ultra's use velcro to attach the soles? If yes, can another brand of soles be used? The company 3G makes this shoe. Due to the time it takes to produce the 3G Mens Tour Ultra Black RH ball it will ship in immediately. We cannot ship this ball outside the United States.